Avery Thermal Barcode Printers and Accessories brought to you by Century Systems, Inc.
A full range of printer accessories provides versatile forms handling and finishing for tag and label production. Integrated knives, online verifiers, unwinds, and rewinds can improve both efficiency and productivity in a variety of applications. When small batches of tags or strips of labels are required, the integrated knife provides an effective solution. 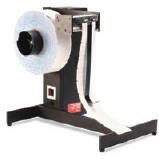 For easier handling of large batch jobs, the power rewind handles rolls of printed pressure-sensitive labels or tags up to 10" in diameter and 5" wide. A slitter option is also available for 2 and 3 up labels. The Avery Dennison On-Line Verifier is designed to maximize throughput and productivity. The system saves you time and money by preventing unscannable labels from getting through the supply chain potentially limiting charge backs. Not only does the OLV provide an immediate alert to an error condition, it can also automatically reprint tags of labels with faulty barcodes. are compatible with both direct thermal and thermal transfer. the GL100 units feature 3" core holders with 12" OD and can handle label widths up to 9" wide. Electronic speed controls automatically synchronizes winding speed with the Avery printer's speed. Both can run at speeds from 1-24 in/sec. Auto-switching universal power supply can adapt to any production setting in the world. The perfect solution for standard production runs, at speeds from 1-10 in/sec and handles label roll width from 1" to 4" wide. 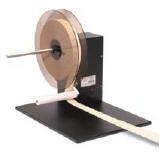 GLR50 comes with standard 3" core holders with a maximum media roll diameter of 8". Auto-switching universal power supply.